A property developer recently installed a ‘landing pad’ for drone delivery at a new block of flats in Chatswood (Sydney). So when I read self-driving vehicles are arriving in Australia sooner than expected, my anxiety regarding my unhealthy demerit point balance on my drivers licence diminished. Are self-driving vehicles going to revolutionise our lives? Yes. A convoy of self-driving trucks recently drove across Europe and arrived at the Port of Rotterdam. Now if you are a current truck driver, don’t despair yet. ‘Armageddon’ is still a long way off. Of course its inevitable technology will automate away some jobs in transportation. But it will also create jobs. The first two mines in the world to start moving all of their iron ore using fully remote-controlled trucks was in (…you guessed it) Western Australia’s Pilbara. While there aren’t human drivers, you can bet there are humans in the central control room. And if you are a parent lamenting your child’s addiction to Xbox, PlayStation or any other Online game console, … there is hope. I’m talking about paid employment too. 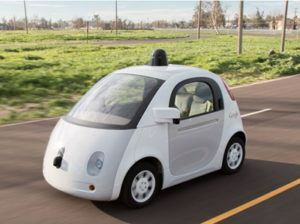 Driverless cars would mean you wouldn’t need to drop the kids at sport anymore. Think about the time saving! But until that happens, the big question for the global logistics industry is not just driverless vehicles. It is about how to build roads to accommodate them to co-exist with human drivers. In the short term, the logistics industry will focus on using self-driving vehicles in ‘closed environments’ that are secure private zones they control. These are ports, warehouses and manufacturing facilities mainly. Liability issues are less pressing when that vehicle is transporting goods instead of people. One pioneering example of driverless vehicles is at the Harbor Container Terminal Altenwerder in Germany. It is the most modern container handling facility in the world. Container handling is almost completely automated. A total of 84 driverless vehicles transport containers between the wharf and the storage areas via the fastest possible routes. Navigation is performed using 19,000 transponders that are installed in the ground. This greatly increases the speed and efficiency of container handling in comparison to traditional transport methods using trucks and cranes. The rise of autonomous vehicles will have huge implications for delivery supply. Trucks will be able to drive 24 hours a day and deliver at any time, although some downtime will still be required for charging of electric vehicles and general maintenance. This will mean safer, more reliable and lower cost deliveries. Costs would fall and efficiency will improve, with fewer deliveries rejected because no-one’s available to accept them. By pinging the location of the recipient ahead of time, logistics businesses will reduce administration, storage and redelivery expenses – and increase customer satisfaction. Call me biased but as a human I’ve got a degree of paranoia that robots will literally one day take over the world. Let me rephrase that, I’m probably more concerned they’ll take too many jobs! The flip side of disruption (which I do keep reminding myself) is it creates job opportunities. Yep that’s right, jobs that don’t exist today, will be created by driverless technology. A job title like ‘Robot Performance Manager’ might be a job my daughter Abigail applies for on Seek! Hey, it’s possible! So, if logistics, transport and supply chain is an industry you are keen to get into or progress within, learn about the changing trends in the transport and logistics space in our Online Diploma of Logistics.